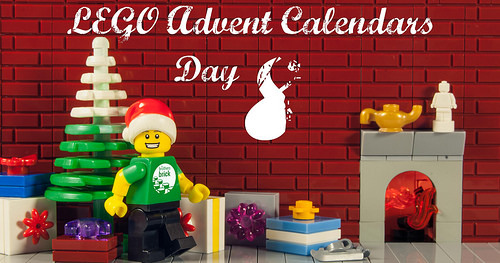 Welcome to Day 8 of our LEGO Advent Calendar countdown. Each day, we’ll reveal the three mini-builds from the LEGO City, LEGO Star Wars, and LEGO Friends 2017 advent calendars along with commentary from our team. If you’re opening one (or more) of these advent calendars along with us, we’ve made sure the pictures and commentary on each day’s models will be behind a jump and posted in the evening every day, so we don’t accidentally ruin the surprise. Will Day 8 be great? 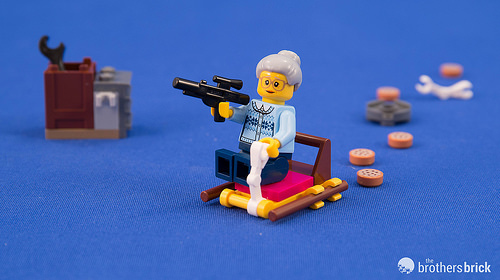 For Day 8, we have a sweater-clad grandma minifigure with a plate of cookies from City, a supply box with blaster from Star Wars, and a simple sled from Friends. 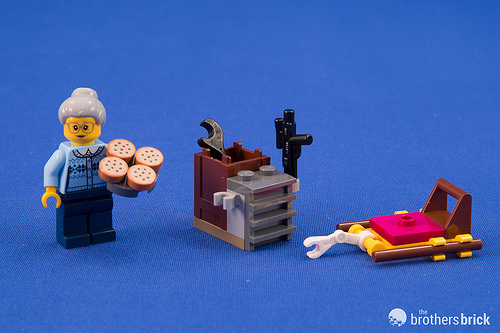 Dave: As only the second minifigure so far from City, Grandma is a welcome addition. Her blue knit sweater torso is new this year and was most recently in the Winter Village Station. I love any new prints for the colder months! The supply box follows a tradition of having one of these every year in the Star Wars advent calendar, and it is ok to take a break since it has been stellar so far. The Friends sled really missed an opportunity to include both an animal and brown hockey sticks. Luka: There are never enough cookie pieces and the Star Wars build’s grey ladder piece is welcome. The sled, though, could learn a thing or two from city. Andrew: Hmmm… I’m not so sure about that skeleton arm on the sled. In white, all I can see is a disembodied skeleton arm. Daniel: Oh, look. another sled. This one seems kind of lame by comparison. Although if you put the Friends snowmobile in front… sled convoy! Edwinder: Looks like Grandma “Die Hard” Willis is preparing for something special! Vehicle, check! Weapons check! Cookies, check!!! Elspeth: The epitome of Christmas for me; Grandma riding on a sleigh, wielding her new semi-automatic rifle! Daniel: Look out, Granma’s got a blaster! And she’s droppin’ her cookies! Alexander: This totally looks like a complete set with lots of playability! Andrew: Yes! No reindeer are going to run over this grandma this Christmas. Pew pew! Edwinder: Grandma Willis has shown her true colors, and it ain’t nothing about them colorful cookies. Her kitchen ain’t hot enough for action, and her boy Bruce needs some backup! You don’t need to ask her twice! Dave: You will like these cookies or else! Luka: To me, all this looks like is a militarized cookie powered sleigh. The 2016 SWAC had no weapons racks. It did have one working artillery piece, but that was as close as it got. It seems with the transition to DWAC, there just isn’t enough material to work with without going back to that hated tradition. And then most of what they did base on the movies shows just how iconic even the prequel stuff is in contrast. When I saw the full spread of models back during NYTF coverage, the only stuff that jumped out and said “SW” to me was anything that was basically cribbed from the OT. Everything else just looked weak lumps of bricks, which probably explains why this one lasted long enough to see heavy discounts.